Friends often ask if passengers interrupt me to talk while I’m writing on the ferry. My table tent sign is an invitation for questions, and I’m finding that those conversations are often fruitful. So far I’ve met several other writers, a whale researcher, a delivery truck driver, and numerous crewmembers. All recognize that I’m working, so they keep our chats brief. A few weeks ago, one of those meetings turned into an ongoing conversation. Elizabeth Menozzi introduced herself to me as a fellow writer from Orcas. “I do this, too,” she said. 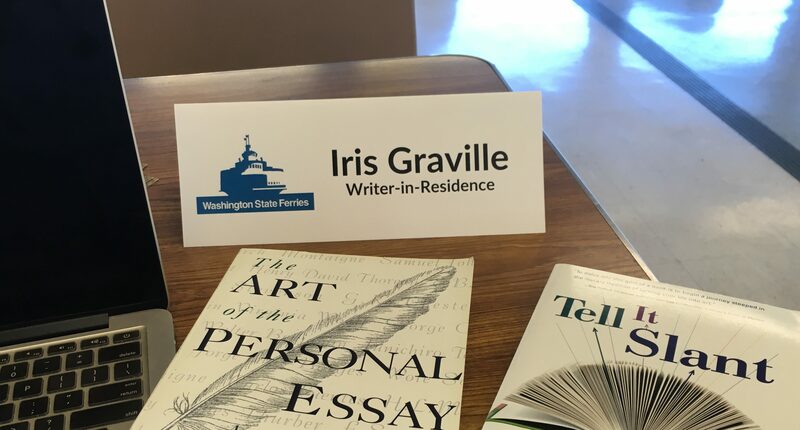 “Maybe we could write together sometime.” She went on to explain she’s a Municipal Liaison for National Novel Writing Month (NaNoWriMo) and has been organizing “write-ins’ in the San Juan Islands. We exchanged business cards and soon were emailing to set up a time for a write-in on the interisland ferry. NaNoWriMo supports writers to complete a first draft of a novel in the month of November. Elizabeth, who writes science fiction and fantasy with romance, has participated several times. A recent arrival on Orcas, she’s committed to completing her second novel this month. She decided to seek support and camaraderie with other islanders by hosting shared writing times at coffee shops, libraries, or anywhere writes want to meet. I have no aspirations to write a novel; in fact, writing fiction daunts me. But as a nonfiction writer for nearly twenty-five years, I know how helpful it can be to gather with others and write together. Elizabeth and I suspected that offering a write-in on the ferry might inspire others with the same goal, so we scheduled one for November 10. I boarded first on Lopez Island and wrote alone during the forty-minute sailing to Orcas Island. Then Elizabeth, Shannon Page, and Mark Ferrari joined me in a booth. Essential writing tools covered the table—laptops, notebooks, and chocolate. Forty minutes later, the ferry stopped at San Juan Island. Joanne Gerry found us and completed our group of five. Typically, I would have continued writing on board until the ferry returned to Lopez an hour-and-a-half later. But that day, I rewarded my writing efforts by disembarking with all of the writers on Orcas and carpooling to Eastsound for the second annual “Hops on the Rock” beer festival. 530 words of fiction (written during the shortest leg of the route). 1 stop at Darvill’s Bookstore – a superb indie just a block from the festival venue. As with any creative art, writing requires discipline, practice, and dedication. Most writers I know are always looking for inspiration, motivation, and the ideal writing spot. After the write-in on the interisland, I know I’m not the only one to recognize a ferry is a novel place to write. This entry was posted in NaNoWriMo, writer-in-residence. Tagged Hops on the Rock, NaNoWriMo, San Juan Islands, Tillikum, Washington State Ferries, writer-in-residence, writing. Next Post Next post: What’s the Plan? We are thoroughly land-locked here in the middle of North Carolina — so your NaNoWriMo write-in on the ferry seems magical. I was part of a writer’s loft when I lived in Massachusetts and I was amazed at how much I wrote while surrounded by other writers — I miss that comaraderie. Thanks for sharing this event with us. Writing on the ferry IS magical, Nancy. And I know what you mean about the importance of writer camaraderie – whenever we can find it. Hope your writing is going well. The ferry is the only place I write anymore. Too many distractions at home with all the things that need doing. I agree, Cheryl! I find the scenery and the people on the ferry less distracting than the piles of papers and books on my desk at home, and the reminders of all there is “to do” around the house, yard, and community. Maybe we can write together on the interisland some time!